Scotch Eggs | Have YOU Ben Starr Struck? I had never heard of a Scotch Egg until I watched MasterChef season 1 and Ramsay was bemoaning the lack of a Scotch Egg appearing in an egg challenge. When I heard what it was…a boiled egg wrapped in sausage, breaded, and deep fried…I was bound and determined to offer up a Scotch Egg to Ramsay during my season, but the opportunity never arose. On Season 3, Monti Carlo won my heart by making a Scotch Egg with fresh crab meat in place of sausage, which I thought was a stroke of genius. 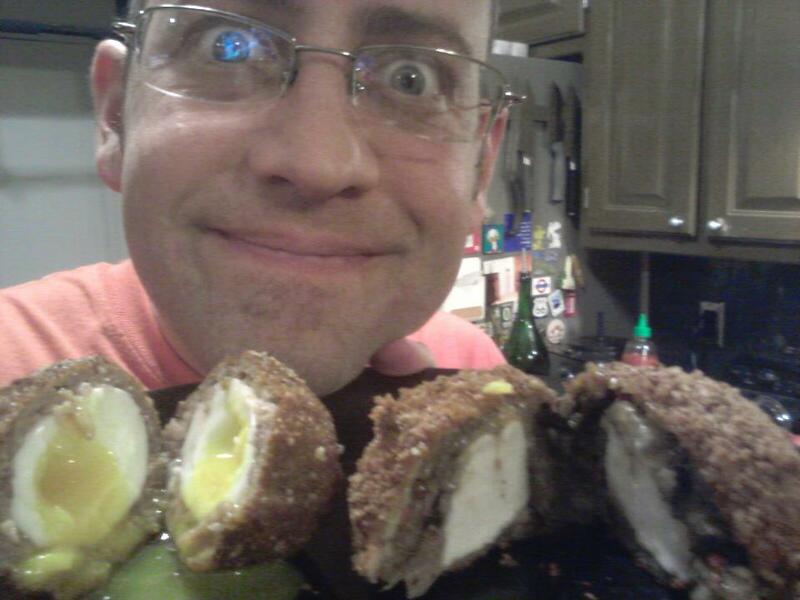 The problem with Scotch Eggs is that they are deep fried, and I try to limit my use of the deep fryer. But last night, my housemate Chris wanted me to make some deep fried smoked mozarella, eggplant, and mushroom fritters, so I told him to pick up an extra dozen organic eggs at the grocery store and I’d make double use of the deep fryer if we were going to bust it out. The nice thing about Scotch Eggs is that you can use any kind of sausage to wrap the eggs in, from breakfast sausage to Boudin or Mexican chorizo (as one of my fans does), and you can even make your own sausage from ground meat, flavored however you like, or you can grind your own exotic meats (venison, wild boar, duck, etc.) if you have a meat grinder. The recipe is actually quite simple, and consists of eggs, sausage, and bread crumbs. (I season my bread crumbs with parmigiano and garlic powder to give them an extra punch.) I think it’s important to use free range, organic eggs for this recipe, because the yolks are served very runny. You want as little chance as possible for contamination, and industrially-produced eggs always carry a higher risk because of the cramped and unsanitary living conditions of the chickens. (While we’re on the subject, just switch over to organic eggs period. Yes…you will spend an extra $3-$4 per week on eggs. That’s the price of a single Starbucks latte. The difference in taste alone with worth it, but think of all the happy chickens you’re supporting, and you’re sending a clear message to the poultry industry that you want your eggs from happy, free ranging, organic hens!) This recipe works a little better with older eggs rather than super fresh eggs. Bring a pot of water to a boil and gently lower the eggs into the boiling water with a slotted spoon. Cover only until the water comes back to a boil. Cook the eggs for exactly 5 minutes from the time they go into the water. Remove them from the heat, drain off the hot water, and immediately place under cold running water from the sink. Cool the eggs for 5 minutes, then VERY gently crack them all over and peel them. This can be tricky, because the eggs are only soft boiled at this point. Be as gentle as you can. The older the eggs are, the easier they will peel. Once you have gently cracked the shell all over (on a flat surface) you can VERY gently massage the egg between your palms to help loosen the membrane that complicates peeling. Don’t try to peel off huge chunks of shell at a time or they can tear or pierce the white. The smaller the bits of shell that you peel, the smoother the egg will be. Once the eggs are peeled place them in the fridge for at least half an hour to firm up. Divide the sausage into 6 parts. Smash one of the parts in the palm of your hand until it is flat and fairly thin. Then set the egg into the center of the sausage and gently wrap the sausage around the egg, smoothing over the locations where the sausage edges meet each other. This is awkward. But you’ll get the hang of it. Gently roll the eggs in the flour and pat until the excess flour has fallen back onto the plate. Then roll in the egg. The in the bread crumbs. Deep fry at 365F for 3-4 minutes until the bread crumbs are nicely browned. Don’t fry too many at a time, you don’t want to cool off your oil. Salt them lightly when they come out of the oil, and hold them in a 200F oven until all the eggs are fried and ready for serving. This entry was posted in Breakfast, Main Courses, Recipes and tagged Carlo, deep, egg, eggs, fried, fry, Gordon, homemade, Master Chef, MasterChef, Monte, Monti, Monty, Ramsay, Ramsey, recipe, sausage, Scotch. Bookmark the permalink. You’ll want some HP sauce to go with those. I’ll have to try this, it looks so good with the softer egg! I’ve only seen them served with hard cooked eggs. Methinks a perfect storm has been brewing for me to make a batch of Scotch eggs. First up is the fact that my in-laws retired to the lower 48 last month, and they generously donated various kitchen gadgets and appliances to my pantry- among them, a large table-top deep fryer. Secondly, there’s that pound of caribou sausage in my freezer that I’ve been holding off on preparing because I want it to be the clever star of a dish, not just a component (i.e.- unceremoniously plopped atop a pizza, or lost among the Trinity and beans in a Cajun meal). Then there’s the fact that at my last trip to my butcher, my little eyes spied a new sign. “Alaskan-Grown Organic Eggs: $4/dz”. Lastly is this blog post sitting in my inbox this morning, and once again the light bulb goes off which a nearly-audible “Ding!”. So there you go again suggesting the perfect culinary solution to my creative crisis, Mr. Starr. In the past 2.5 weeks, I’ve unfortunately found that I have a severe gluten intolerance, so perhaps I’ll finally get a chance to test if smashed Rice Chex cereal is indeed a suitable replacement for panko. Make sure to let us know how the cereal substitute works! Hey Ben, thanks for sharing. I don’t think I’ve made Scotch Eggs for about 20 years. Back in those days I would have never had them soft boiled but I would love that now. This sounds like a fun one to do this weekend. I almost never deep fat fry anything but I do have a treat on occasion. You make it sound so simple and my mouth is watering for some right now! Thanks Ben! !